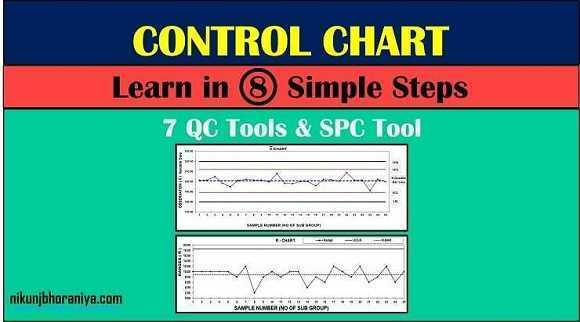 What is the Control Chart in 7 QC Tools? ➝ It is a statistical tool used to differentiate between process variation resulting from a common cause & special cause. 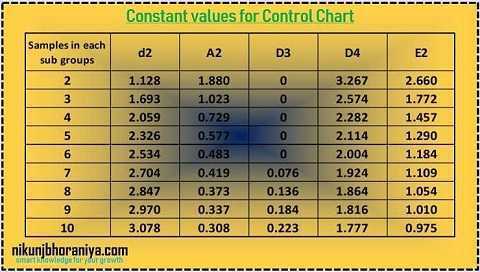 ➝ The Control Chart in 7 Basic QC Tools is a type of run chart used for studying the process variation over time. → This Chart is classified as per recorded data is variable or attribute. 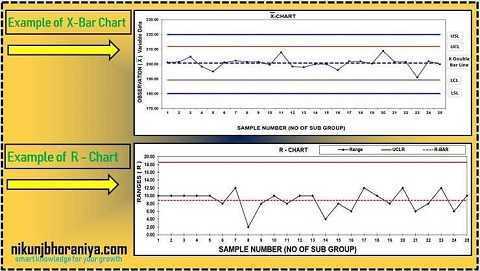 → It is a type of run chart used for studying the process variation over time. 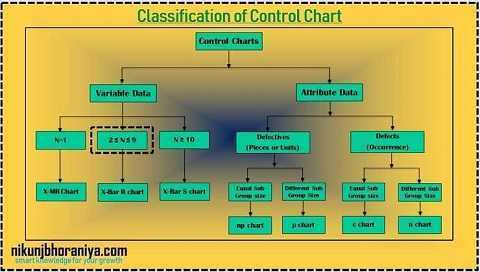 ➝ The Control Chart was invented by Dr. Walter A. Shewhart working for Bell Labs in the 1920s. ➝ So this is called as a Shewhart Control Charts. ➝ The company's engineers had been seeking to improve the reliability of their telephony transmission systems. ➝ Because amplifiers and other equipment had to be buried underground, there was a stronger business needs to reduce the frequency of failures and repairs. ➝ By 1920, the engineers had already realized the importance of reducing variation in the manufacturing process. ➝ Dr. Walter A. Shewart Published the book called “Economic Control of Quality of Manufactured Product” in 1931. ➝ Every process has variation. ➝ More the variation in the process, more the loss to the Organization. ➤ Two types of cases available for variation. ➝ Action on variation entirely depends on the type of cause identified. ➝ "Common cause variation is fluctuation caused by unknown factors resulting in a steady but random distribution of output around the average of the data." ➝ "Special cause variation is caused by known factors that result in a non-random distribution of output"
→ There are two types of data set available. → Variable data can be measured. → Here we take an example of the most common chart (X-Bar, R chart). Compute the average of the range. 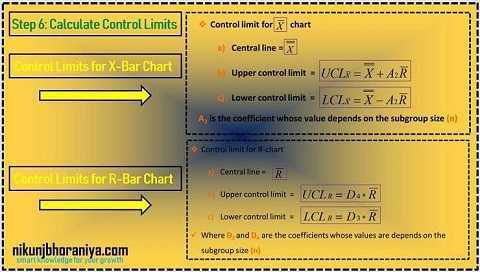 Calculate the control limit for X-bar and R chart. Plot the data in the graph. → Collect and stratify data into subgroups. → Here we find the overall average by using all sub group's individual average. 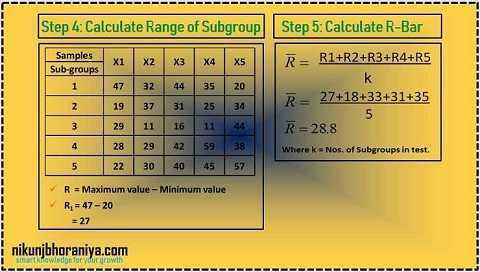 → In the fourth step, we find the individual sub group's range as per the mentioned formula. → Here we find out the average range of all individual subgroup's range. → In this step, we find the limit of X-bar and R chart with below-mentioned formula. → Vertical axis: X-Bar and R values. → Horizontal axis: subgroup number. → Draw all control limits UCL & LCL. → Plot the X-Bar and R values and join the points. → Write necessary items like the name of the process, product, size of the subgroup, work conditions, shift, etc. ➝ Look at the pattern of variation. ➝ It should be random and not a systematic pattern. ➝ Look for the presence of special causes. ➝ 8 rules of special cause identification e.g. are our process enough to continuously meet the customer's specification? ➝ Compare with specification and establish process capability e.g. are our process capable enough to achieve customer's specification? ➝ This Chart gives information about common causes of variation and special causes of variation. ➝ It also helps in determining whether the Process is capable or not & the process is stable or not? ➝ It helps in predicting process performance. ➝ This Chart indicates whether the process is in control or not? so, we can get the information about the behavior of the process. ➝ It makes possible to implement substantial quality improvement.